OSWEGO, NY – Joseph McManus has been named assistant vice president/computer operations manager at Pathfinder Bank, according to Dan Phillips, chief information officer. McManus’ duties as computer operations manager will be to continue to maintain and improve network security as well as manage and maintain the banks network infrastructure. He also has a key role in providing end-user support and mainframe operations. McManus has a Baccalaureate of Arts degree from the State University of New York at Oswego in Information Science. He has more than 15 years of experience in Information Technology, previously working as senior network technician for Oswego County National Bank and as a senior information systems architect for PCC Information Services. McManus began his career with Pathfinder Bank in 2008 as a computer operations manager. McManus resides with his wife and son in Oswego. In his spare time, Joe is a deacon at the Oswego Alliance Church and is working towards his Blackbelt in TaeKwonDo. He is also the board president of Friends of the Library, a Pathfinder Bank Money Smart Educator for the “Keeping Safe in an Electronic World” curriculum, and a volunteer network administrator for Oswego Community Christian School. 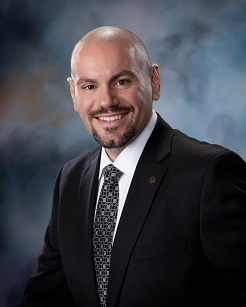 In 2013, he was named one of Oswego County’s “40 under 40” and also graduated from Leadership Oswego County. Pathfinder Bank is a New York State chartered savings bank headquartered in Oswego, whose deposits are insured by the Federal Deposit Insurance Corporation. The bank has nine branch offices located in Oswego, Fulton, Mexico, Lacona, Central Square, Cicero, and Syracuse.